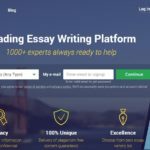 Edusson is a new writing service that’s attracting a good deal of attention. It works according to the bidding principle – you place an order and wait for the bids of the writers. However, there’s still a price you get while placing the order, and it’s not that affordable. So, I got the worst of two worlds – the difficulty to choose a writer combined with a high price with no potential for discount. In the dropdown menu under Services, you get the following options: essay writer, essay editor, essay help, essay checker, write my essay, and write my paper. Yup, I was just as confused as you are. Basically, Edusson.com provides essay writing and editing services. Nothing more. In the order form, however, you get a different impression. It lists other types of projects, too: assignment, article, admission essay, creative writing, critical thinking, math problem, dissertation, and more. There’s a nice calculator that lets you see the price for your order. I chose a deadline of 6 days and got a price of $62.5 for an essay of 2 pages. That’s $31.25 per page, and it’s expensive. There are no quality options to choose from. The range of prices starts from $22.25 and goes up to $40.25 per page. The lowest deadline is one day, so you have no option to get the paper in few hours. No discounts here. It’s a bummer. Bidding services are supposed to be more affordable, since you’re working with freelance writers, who usually don’t have the expertise you get from traditional writing services. Here, you’re paying a higher price for such a service. The ordering process is pretty simple. However, you do need to register first. It was a waste of time, but I still placed the order within minutes. Soon after that, I started receiving the bids. The money was reserved, and the chosen writer got them after I received the paper. There’s an option to ask for a refund, but that didn’t work in my case. The communication with my writer went fine. He quickly responded to my questions. It seemed like he was accepting my suggestions. However, I have to mention the fact that not all profiles of the writers seem professional. You’ll notice that a single writer covers topics from psychology, sociology, religion and theology, English, and even aviation. That being said, it’s clear that you’re working with freelance writers, who are only paraphrasing online sources. They can’t have extensive knowledge in all these disciplines. Fortunately, I got the paper on time. In fact, the writer delivered it few hours before I expected it. It was far from perfect. I don’t usually ask for refunds straight away. I give the writer a chance to fix the paper according to my instructions. In this case, there was no use of corrections. The essay was completely paraphrased from online sources, and I easily found the ones my writer used – the first ones that appear on Google when you search for the topic. I didn’t get a refund, though. The customer support agent explained that there was no detectable plagiarism in the paper and it was completed according to my instructions. So, they took my money and I got an essay that didn’t meet my standards.